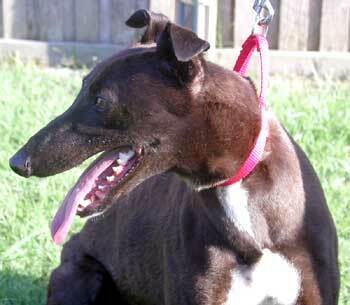 Desi is a sweet, loving 9-year-old beautiful black female greyhound. 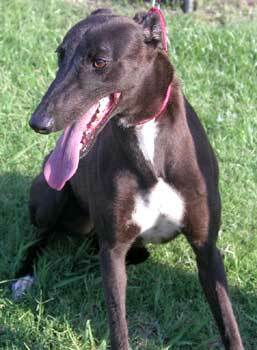 She originally came to GALT as a stray along with Paris. Desi is petite, very "chatty" and loves to play. Desi gets along well with other dogs, and she is small animal and cat tolerant. Desi was in a home for over 5 years, but has since returned to GALT through no fault of her own. This gal is a pro at home living, and would love to meet you! Desi is a very petite, dainty 3-year-old brown/black little girl with a white ticked chest and an almost border collie intensity in her big brown eyes. She wants very, very much to have people to call her own. At first she can be shy and hesitant to approach adults, but bonds very quickly after her initial shyness passes. Desi loves children and other dogs and has passed her cat testing with flying colors. She will do best in a loving home with another dog, hopefully a big male: she has become quite attached to her foster brother Cody, and looks to him for comfort and security. Desi is a quick study - she didn't need any instruction on using the dog door. All she needed was to see other dogs go in and out once and she had it figured out! Desi has never had an accident in the house; however she will occasionally steal small electronics such as TV remotes and cell phones. Desi won't destroy them, she just thinks she should put them in safer places such as her favorite patch of grass in the back yard. She loves to be fed (and will not hesitate to tell you that she's ready to eat) and touched and petted. She loves to give little kisses. Desi is fantastic in the car, she'll jump right in and then settle down for a comfy nap. This precious, beautiful little girl is ready to be matched with her forever family and begin the life of leisure, love and happiness she so deserves.